The ability to successfully persuade is a powerful skill. Whether you want to be a better sales person or to improve your ability to lead, being persuasive can be key to your success in work and life. At the end of this post, you’ll will find the full infographic which sums up the science of persuasion in graphical form. Herein, we intend to expand upon six universal principles that are often employed to successfully influence others. These six principles are derived from research done by noted Psychologist Dr Robert Cialdini and others. The first shortcut to persuasion is Reciprocity – the obligation people feel to give after they receive something. 3. Finally, in the third trial, customers were each given one piece of candy. Then the waiter left the table, however, before the waiter completely left the area, they came back and gave a second piece of candy to each customer. Through this gesture, it was almost like saying “…oh, for you nice people, here is an extra candy each”. 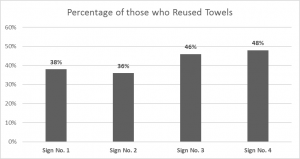 The experiment concluded that people are more reciprocatory after they received something. Additionally, the way in which they received that something influenced the outcome. Such as in the third trial where customers at the diner tipped more after it appeared the waiter made an exception for them. The second of the six shortcuts to persuasion is Commitment and Consistency. People are creatures of habit and live by consistency. In 1987, an experiment was conducted by social scientist Anthony Greenwald. Greenwald approached potential voters on election-day eve to ask whether they would vote, to which 100% of participants said they would vote. On election day, 86.7% of those asked, casted their vote, compared to 61.5%, who were not asked. This experiment highlighted that those who publicly committed to vote were more likely to actually vote. This tendency to commit to an agreement is another universal principle of persuasion. Furthermore, when people make a commitment, they are more likely to follow through with an action or decision, in order to remain consistent with those commitments. People are inclined to look at what others are doing as a basis for taking action or making a decision. This is known as Social Proof and is the third shortcut to persuasion. 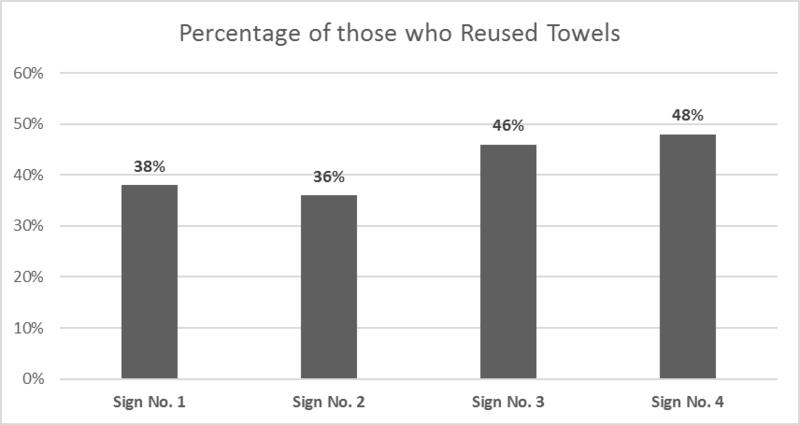 The experiment concluded that when guests found out that most people who stayed in the same hotel reused their towels, they were more likely to comply with the request. In 2005, Randy Garner mailed out surveys to strangers with a request to return them. The request was signed by a person whose name was either similar or dissimilar to the recipient’s. For example, Robert James might receive a survey request from the similarly-named Bob Ames. After the study, the article explained that sales people could improve their chances of making a sale by becoming more knowledgeable about their prospects’ existing preferences. The fifth shortcut to persuasion is Authority, people respect and trust authority and often seek the lead of credible experts. Being in a position of authority or giving the appearance of authority, increases the likelihood that people will comply with a request. [an experiment] where ordinary people were asked to shock ‘victims’ when they answered questions incorrectly. Those in charge were dressed in white lab coats to give the appearance of high authority. The participants were told that the shocks they gave increased 15 volts in intensity each time the person answered incorrectly. In fact, the shocks were completely imaginary. Respondents were acting. As participants continued to shock their victims, the respondents feigned increasing discomfort until they let out agonized screams and demanded to be released. Astoundingly, about two-thirds of participants ignored these cries of pain and inflicted the full dose of 450 volts. The experiment showed that people in authority have incredible influence on others and when correctly incorporated, this influence helps persuade others to make a decision. The final of the six shortcuts to persuasion is Scarcity. For example, retail stores often offer sales for limited periods, such as for the weekend or on a celebratory day. The scarcity of this opportunity to purchase a product at a discount encourages people to buy. In 1985, the Coca-Cola Company made their infamous switch from their traditional formula to the sweeter formula “New Coke.” Their taste tests indicated that 55% preferred the new Coke over the old. Most of those tests were blind, but some participants were told which formula was new and which was the original. Under those conditions, the preference for new Coke increased 6%. Despite the taste tests, the switch to new Coke triggered incredible backlash against it. Time magazine later dubbed it “the marketing fiasco of the decade. In fact, what that 6% really meant was that when people know what it is they can’t have, their desire for it will shoot up. Later, when the company replaced the traditional recipe with the new one, it was the old Coke that people couldn’t have, and it became the favorite. The experiment showed that people are more likely to seize an opportunity if they know that opportunity is limited. Utilizing this principle, people are more likely to be persuaded if what is presented to them is rare or if they feel they will not have a chance at this opportunity again. Next time you have a critical presentation, sales demonstration or startup pitch — stop and think about how you can be more persuasive with your message. This simple infographic below details the science can help you get there. As usual, please leave comments or questions below. We love to hear from you! 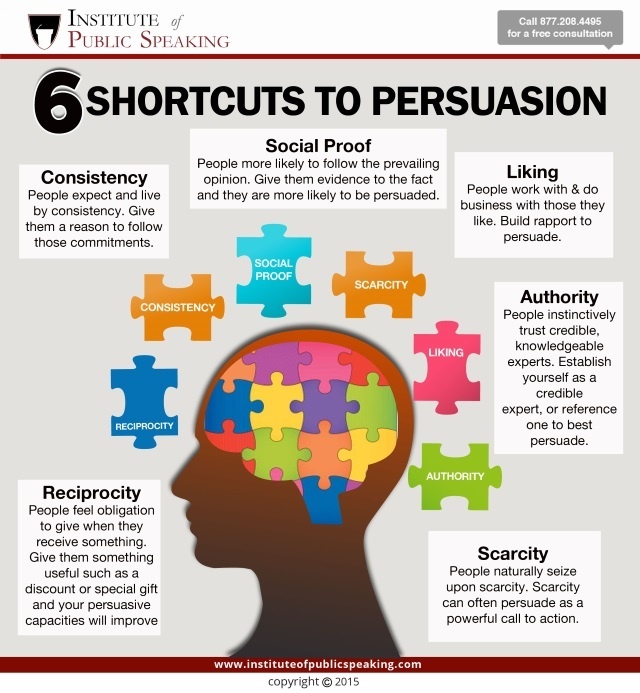 5 Responses to "6 Shortcuts to Persuasion – Infographic"
These are some phenomenal points! I hadn’t really considered reciprocity as a means of persuasion. But, it makes so much sense! And I’ve definitely observed Authority and Social Proof in the act of persuasion on a daily basis. Really informative article! Another great public speaking infograph that sums up the article very well. I completely agree with all your points. I never considered scarcity, but you explanation to why it’s important definitely makes sense and has convinced me. After reading this, something came to me. Have you ever noticed that leader who are persuasive and at any level can convince a lot of people they are right even when they are morally wrong? I see it happening a lot on social media. This is another great infograph. I need to learn how to harness this ability and have it work for me. Yes sometimes persuasive people are capable of short-lived manipulation but it doesn’t lend itself to successful long-term outcomes. People do eventually see through manipulators. This is so funny because I did some reading and got in touch with a friend a few weeks back who spoke on public speaking and he did mention people enjoying your public speaking classes! Another great read Joseph!